66 years, 5 months, 24 days old age. 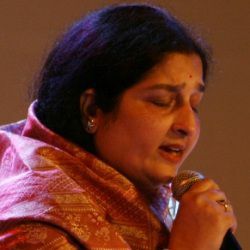 Anuradha Paudwal will turn 67 on 27 October, 2019. Only 6 months, 6 days, 3 hours, 59 minutes has left for his next birthday. Anuradha Paudwal has celebrated the total number of 66 birthdays till date. See the analysis by days count and bar graph. Anuradha Paudwal was born on 27-10-1952 in Karwar in the state of Karnataka, India. She is an Indian Playback Singer & Singer who known for her work in Bollywood Industry. She was among the most successful singers during the 1990s and has won a National Award and 4 Filmfare Award for best singer. Her maiden Filmfare award, she received for the song Mere Man Bajo Mridang of the film Utsav in 1986.Come the 1990s and she created history by winning the best singer award for three consecutive years from 1990 to 1992 for the song Nazar Ke Saamne from Aashiqui, Title Track from Dil Hai Ki Manta Nahin and Dhak Dhak Karne Laga from the film Beta. In 1990s decade her voice was mostly used for ace actresses Pooja Bhatt and Madhuri Dixit. Apart from singing in movies, she has delivered a series of hit albums like Choodiyan, Ishq Hua, Afsana and several others. In addition to films and albums, she has sung several devotional songs and bhajans as well. Anuradha Paudwal made her singing debut at the age of 19 by singing a Sanskrit shloka in the film Abhimaan in 1973. She got her first major break as a playback singer with the song Aap Beati of the film titled Kalicharan in 1976. Her collaboration with the King of cassettes, Gulshan Kumar completely changes her fortunes. Through T-Series, she got the opportunity to sing in films like Dil, Dil Hai Ki Maanta Nahi, Aashiqui and several others, thus helped her in establishing herself as one of the leading singers of Bollywood. She has worked with noted music composers like Anu Malik, Nadeem Shravan and A.R. Rehman amongst others. She was married with singer Late Arun Paudwal and the couple was blessed with a son named Aditya and a daughter, Kavita.